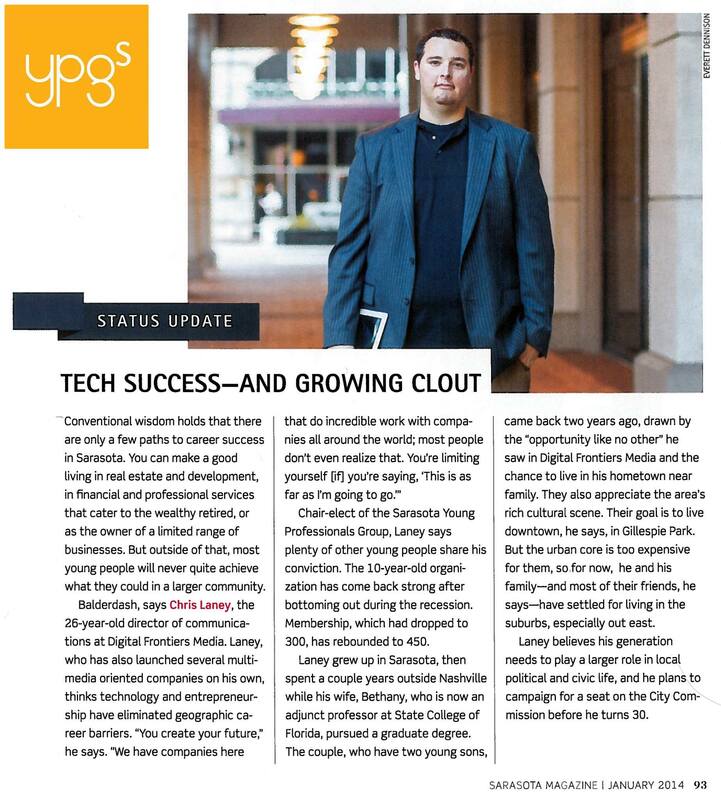 October 17th, 2013 (Sarasota, Fl)—Digital Frontiers Media’s Director of Communications, Chris Laney was elected Incoming Chair of the Young Professionals of Sarasota, an organization of the Greater Sarasota Chamber of Commerce. Laney served as Technology Chair for the past year and has served on various committees throughout the organization. He will serve as Chair-Elect under the new Chair, Sean Duade from Omega3 Innovations. His Chair term begins on October 1st, 2014. “The Sarasota community is strongly in need of a bridge that brings organizations and the community together. We believe YPG can be that bridge. In addition, a focus on good citizenship is essential to the growth of our organization. This includes volunteerism, philanthropy and civic responsibility. We look forward to a very exciting future for this organization.” Says Chris Laney. For more information about the Young Professionals of Sarasota, visit www.ypgsarasota.com.